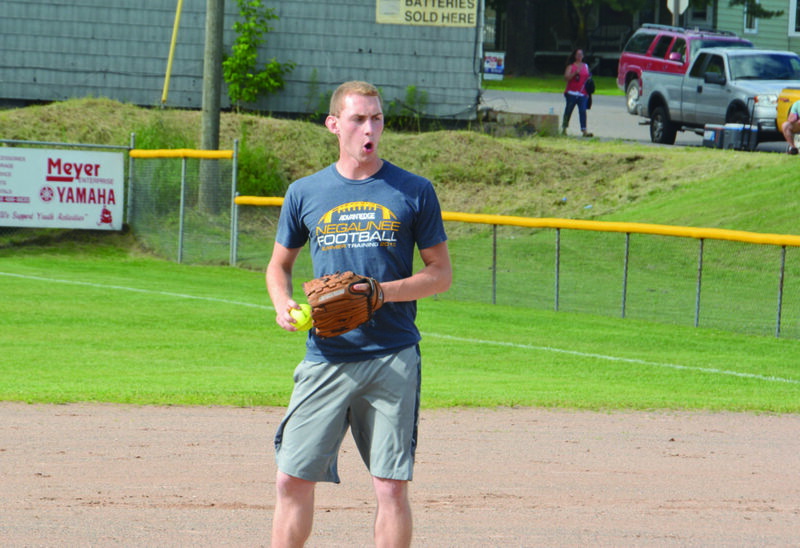 MARQUETTE — The Negaunee high school class of 2017 edged the class of 2016 by a 5-4 score Friday night in the opening match of the annual Negaunee co-ed alumni softball tournament at LaCombe Field. Class of 2017’s Brock Aho said his team put together a roster that’s determined to succeed. Aho’s teammate Ty Koski said his class was blessed with great talent. “We have a lot of athletes,” Koski said. The ages of the teams vary from recent graduates to former Negaunee classes dating back decades. With the two most recent graduating classes playing first, Aho said added to the pressure of their first game. “It’s cool to play the guys that graduated a year before us,” Aho said. Class of ’17 got started early with a pair of runs in the top of first inning, before a triple by Trevor Uren in the fourth scored another pair to make it 4-0. Jeff Matthews got class of ’16 on the board in the bottom of the fourth with a towering home run to center field, but Aho got the run back for class of ’17 in the fifth inning with a standup triple, getting brought home on a sac fly moments later to make it a 5-1 game. Parker Bowman ripped a two-run homer to left field for Class of ’16 in the bottom of the fifth to make it 5-3, and the 2016 Miners tacked on another run with a sac fly to make it just a one run game with the tying run on third base. However, a double play from the class of 2017 ended the rally for the class of ’16, and the new graduates held on in the sixth and final frame to earn the win. Koski said his team never eased off the pressure. The win for class of ’17 ended the tournament for class of ’16, and the winners will play again at 2 p.m. Sunday against an opponent decided the rest of the tournament’s results. Aho said competing in the tournament is a different experience than from the seats. Ray Bressette can be reached at 906-228-2500, ext. 251. His email address is rbressette@miningjournal.net.